The Star variety of Blueberry is the ideal preserving fruit with its firm texture and rich color, and a very high phenolic and anti-oxidant content for their amazing health benefits. 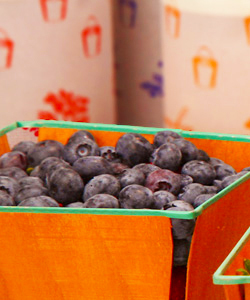 This variety is grown by fifth generation farmers, the Sorensen family and their Triple Delight Blueberries. I have enjoyed seeing their three daughters, who represent the "Triple Delight," grow up over some 15 years to the point where all of them are now involved in the family business along with their husbands (and two grandchildren! ).…very cool. On their 30 acres, located in California’s Central Valley, they employ sustainable farming practices and are certified with USDA Good Agricultural Practices by maintaining high farming and food handling standards. Using no synthetic sprays or pesticides they are in the process of converting to being a certified organic farm in the next few years. As spring arrives in the Bay Area, my thoughts turn to blueberries, strawberries and rhubarb. Our dessert menu opens wide up to greet the season and we all look forward to our first delivery of Triple Delight blueberries! They are flavorful, crisp and frosty beautiful. We appreciate the time and effort Kim and her family take to grow and produce these tasty berries...thank you! The finished KATZ Blueberry Preserves highlight the full flavor and integrity of the whole berry. Similar to our Blackberry Preserves, the texture is a "softer set" making it more like a "compote" than a traditional preserves. Our preserves are made the old-fashioned way...we do not use any preservatives, period! Please enjoy every spoonful of our fresh fruit preserves, and refrigerate after opening. SERVING SUGGESTIONS: KATZ Blueberry Preserves is an ideal topping for your favorite ice cream or yogurt, for serving with fresh ricotta as a simply ethereal dessert, for slathering on a bagel with goat or cream cheese, for spooning over waffles or pancakes, or for spreading on some toasted, fresh rustic bread...eating out of the jar with a spoon isn’t bad either. Making our fresh fruit preserves in the artisanal manner for the past 20+ years has been a true labor of love. Each new season brings the excited anticipation of visiting our farmer friends to see them once again and share in the bounty of their well-tended orchards and fields. In our Napa kitchen, each batch of fruit is skillfully cut or sorted by hand, simmered in small, open kettles, using the smallest amount of sugar and fresh lemon juice needed to set (no pectin, no preservatives). Each "pot of jam" brings you 16 delectable ounces. . .a pound of preserved fruit in each jar hand wrapped in our proprietary Branches paper! Articles in The Atlantic, Saveur, Gourmet, Fine Cooking, and The New York Times have inspired us to increase our production. Yet, with the small window Mother Nature provides for many of the varieties we use, we like to say around here, "when they’re gone...they’re gone!"